Stop. Take a second. Just think in half a year or so from now things left out outside overnight might freeze. Freezing thoughts on these current hot summer days is slightly refreshing. If you have post of fragments then browse over to Mrs. 4444's blog and she will digitally freeze your post link for sharing. It’s Friday Fragment time and the following fragments are taking up space in my freezer brain. There was a time in my past when my gears spun harder. The slipping and sliding from pressure pushing me in various directions generated stress. But a few times it was exciting and even a little fun. Today, I like the idea of a slow river as long as it doesn't run dry. If you don't know what you want then start a blog. This has to be one of the dumbest messages I have ever received. Not only is it disturbingly dumb but the robotic system has left it more than once. To share it on the blog I created this short clip and added the voicemail to the sound track. The only thing good about it is its brevity. It’s only a few seconds of a woman’s voice. The call id shows up as “unknown call” so I don’t understand what action they expect from this message. Take a listen - it’s brief. I believe I’ve discovered a secret. I’m not sure but it might be universal secret code. I’ve been finding more and more age spots. I occurred to me that connecting the spots might reveal a personal message from the other side. If you have enjoyed these thawed fragments please let me know in the comments and even better share this post on FB or G+. Oh if you feel like you have just wasted a few minutes of your life then you need to lighten up and stop thinking about detailed minutes of your life. My 13 year old granddaughter told me the bubble wallpaper on my cell phone (a nice old flip phone) used up extra battery, so she set the wallpaper to the only picture I ever took with the phone--24" of fresh snow fall in the courtyard at work a couple of winters ago. Now, that's cool. That would be a cool picture to look at on a hot day. Unless the "bubbles" moved in a type of video, I don't see how one wallpaper could use more power than any other. Hope the snow cools your day. I got a answering machine message once form an old lady who thought we were the radiology center and wanted to follow-up on her mammogram results because she was worrying. I looked up the correct number for her and called her back and talked with her for a little while because she sounded so lonely. I think that's the dumbest message I've ever heard, too! Loved imagining the freezing weather, though, and by golly, I think you might be on to something with the age spots thing. I need to revise my whole blog, not just my 'about'. Sigh. Yes, the message is friendly, but dumb. Unless, of course, the "important message" is that you have inherited a large sum of money. Oddly enough, today it felt "cold" outside. It was 68 degrees. Such wacky-weather these days. wow 68 degrees - please blow it south. I really think the message is ONLY important to them. thanks for browsing by. Revise your whole blog? why? Thanks for listening to the clip. Whaaaat? Very interesting voice mail! thanks for the "cool" post...I feel cooler already! I've received the same dumb message....I hate them! Have a wonderful weekend! Sorry. I can't imagine that things left outside will freeze in a few months time. Nope. Can't see it. I do know that my children complained that 70 degree weather after a rainstorm was "freezing." They refused to leave our program for at least 30 minutes until they were warm and moist after running wildly through our building. What an interesting set of fragments. You are always so entertaining. thanks I try to make them funny. Thanks for the Honduras climate report. In addition to the tropics not matching my statement the southern hemisphere will be looking at warmer temps in 6 months or so. Blogs do have the problem of being too self-centered. A Few Clowns Short is also off-centered at times. It's a central problem keeping things centered. Freezing thoughts right now are definitely refreshing. I was thinking about how I will walk the block to the senior center when it is icy and slick and wet in winter as I was fighting the humidity and heat this week. 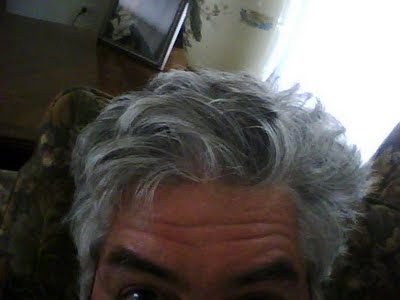 By the time I get to the senior center my hair is wet and I worry that my deodorant is still working.